There are a number of different insulin regimens to fit in with the varying requirements of different people with diabetes. Insulin regimens currently available range from the once-daily insulin regimen for type 2 diabetes, through multiple daily injections, to insulin pump therapy for people with type 1 diabetes. As the name implies, a once-daily insulin regimen involves taking a single dose of insulin each day. The regimen is suitable for people with type 2 diabetes who are unable to produce enough of their own insulin to control their diabetes. People on this regimen will need to take tablets in addition to the insulin. A once daily regimen can either involve taking a long acting peakless insulin or an intermediate NPH insulin. A long acting peakless insulin is appropriate in people with hyperglycemia through the day and night, and is a useful regimen in people who require assistance in taking injections. An intermediate insulin dose is suitable for people who experience high blood glucose overnight and in the morning but better during the day. In this case, the insulin dose will be taken before bed. 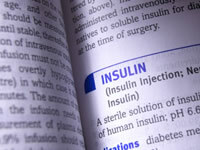 Twice daily insulin regimens may be suitable for people with type 1 and type 2 diabetes. It is important that people on a twice daily regimen keep to a consistent daily routine that includes three meals a day. A twice daily insulin regimen is described as being biphasic because it has two phases of activity. At each injection you will take a mixture of short acting and intermediate acting insulin. The insulin will either need to be manually mixed via syringe or, alternatively, you may take pre-mixed insulin. In type 1 diabetes, a twice daily regimen is suitable in people who have a consistent day to day routine. A twice daily regimen may allow some flexibility for adjusting doses but not as much as a basal-bolus regimen. In type 2 diabetes, a twice daily insulin regimen can be useful for people who experience high blood glucose levels after meals. A basal-bolus regimen, also known as multiple daily injection therapy, involves taking a long acting or intermediate acting dose and separate injections of short or rapid acting insulin at each meal. A basal-bolus regimen is commonly used by people with type 1 diabetes and may also be suitable for people with type 2 diabetes. An advantage of a basal-bolus regimen is that it offers more flexibility over when meals are taken and also allows doses to be varied in response to different carbohydrate quantities in meals. Continuous subcutaneous insulin infusion (CSII), also known as insulin pump therapy, involves having an insulin pump connected to your body. The pump is not much larger than a mobile phone and delivers a constant feed of insulin into the body via a cannula which stays inserted into the fat under your skin. At meal times, an increased burst (bolus) of insulin can be delivered to keep blood glucose levels under control. Insulin pump therapy is generally offered, by the NHS, to people with type 1 diabetes that have struggled to keep blood glucose levels under control on a multiple daily injection regimen. Availability of insulin pumps in the UK can vary from one NHS trust to another. Insulin pump therapy can be particularly beneficial in people that have varied daily routines, are more susceptible to hypoglycemia or have trouble with high blood glucose levels before breakfast. On a fixed dose insulin therapy, the amount of insulin you take at each meal will not vary from day to day. You can be on any of the above injection regimens and on a fixed dose therapy. A fixed dose therapy can help to simplify the understanding of blood glucose results but does not offer the flexibility of how much carbohydrate you choose to consume at each meal that a flexible insulin therapy does. On a flexible insulin therapy you choose how much insulin you inject at each meal. Flexible insulin therapy is particularly common for people on a basal-bolus insulin regimen. Flexible insulin therapy gives you more control of what you eat and how your balance your blood glucose levels but will take time and commitment to learn how best to adjust your insulin doses.